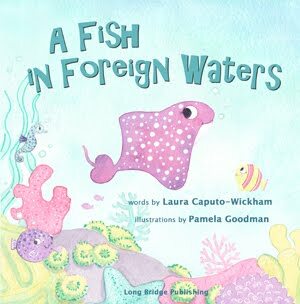 Ive been doing a lot more graphic design work lately, aside from my traditional illustrating. Recently my projects have ranged from window signage to logo design, and album design. Here's a photo of the the hand-painted windows I created for Adorn Bridal Boutique in Los Gatos, CA. Inside you're surrounded by the most GORGEOUS vintage wedding gowns, accessories, shoes, hats and jewelry. AND showcasing the beautiful work of photographers Tanja Lippert, Jill Johnson, wedding cinematographer Luke Goodman, florals from Precious & Blooming, wedding coordinator Jondel Goldsmith of "I Do" Weddings and Events, and DJ services of Ron Grandia. 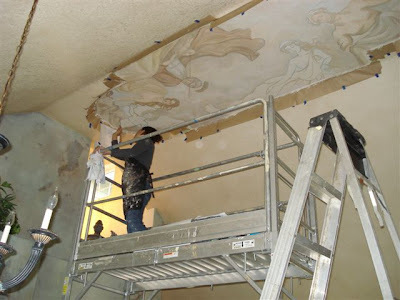 Painting on the ceiling! 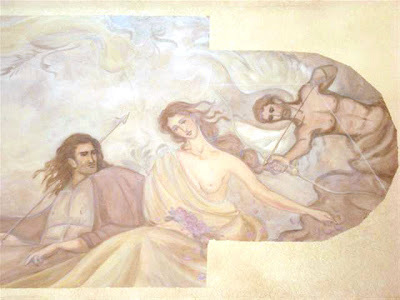 My most recent mural project was a ceiling mural in an old world Mediterranean-themed great room of the Greek gods and goddesses Zeus and his wife Hera, Aphrodite with her lover Ares, and son Cupid lounging in the clouds. It took about 4 days to complete, starting with a layer of smooth plaster and painted with acrylics in a fresco like style. I had to use scaffolding to reach the 15 ft ceiling! 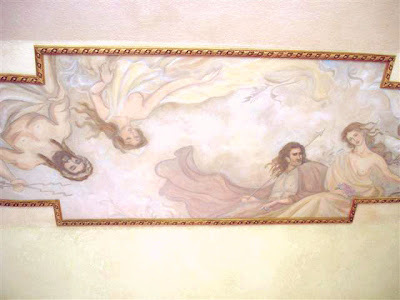 The mural was finished off with antique copper and gold decorative molding. 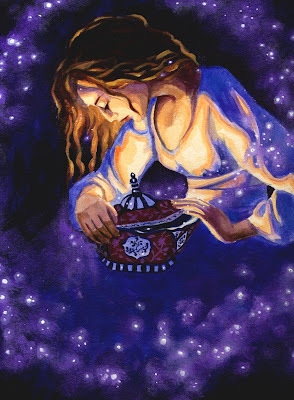 My latest finished painting, which is up on my website too! I did this in one night, although the plaster layer was done 3 years ago! 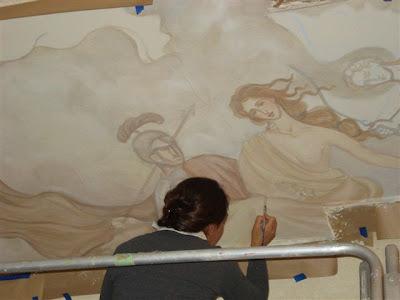 Traditional fresco is painted directly into wet plaster, so this is my quick and easy way of getting that look. I love painting on plaster, its such a rough finish and gives it that old ancient feel. I have been long overdue on my posts, so here's an excuse: Ive updated my website, with a lighter look, and new images! hooray for being up at 2 am on my birthday! Finished illustration! 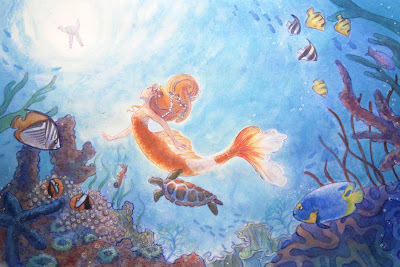 The final layers were done in watercolor and acrylic. 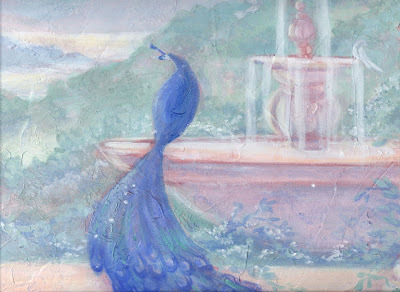 Today I transferred my sketch to my board and washed in the first color layer with watercolor. Next I'll add deeper values and work in more color with acrylics. I've always enjoyed seeing the process of a painting coming together, so I thought this might be fun to see the steps. More to come! I started on a sketch this afternoon, for an illustration of cinderella, the brothers grimm version of the fairytale with the "little bird" as the fairy god-mother. Full color to come! I thought this would be fun to post as it's nearing Valentines Day :) Cupid & Psyche, the famous lovers from Greek and Roman mythology. 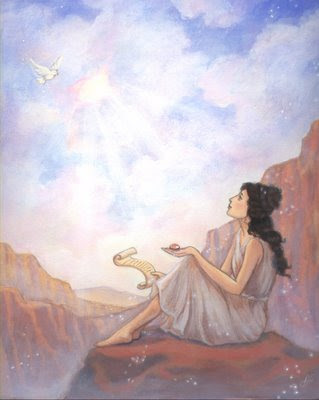 Psyche was a beautiful mortal woman, so beautiful it made the goddess Venus (Aphrodite) jealous. 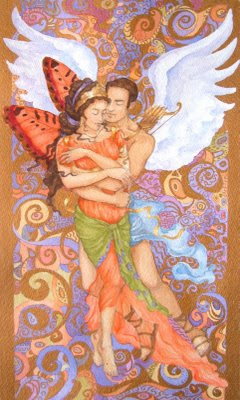 Venus commanded her son Cupid, (Eros) the god of love to make her fall in love with a beast. 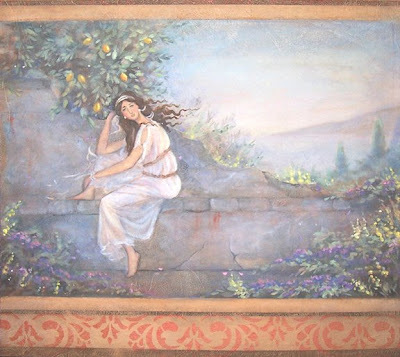 Instead Cupid falls in love with Psyche on his own. Unable to face Venus again he steals Psyche away... she eventually becomes immortal, and of course gets those pretty butterfly wings! My latest illustration was for a client who wanted an image in the style of Maxfield Parrish, the picture goes along with a poem she wrote. Maxfield Parrish is one of my favorite illustrators who used a lot of subtle layers of color to get an ethereal look and feel. Lots of blue and violet in the shadows with brilliant lights. 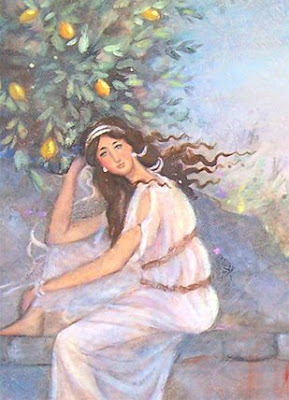 He painted a lot of beautiful scenes of women relaxing in the outdoors, that have a soft dreamy feel. 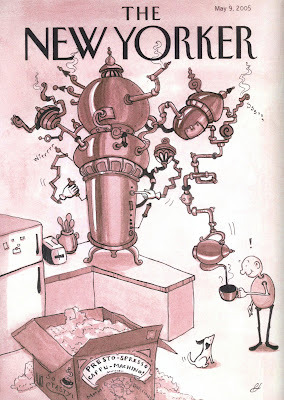 This illustration was done for the online publication, The Whole9, Dec 2008. 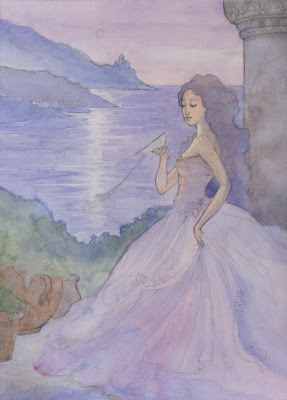 You can view the Dec issue here: http://www.thewhole9.com/newsletters/dec_08.htm The theme was "Change Is Good"
This book cover illustration is from the story and opera, Aida. 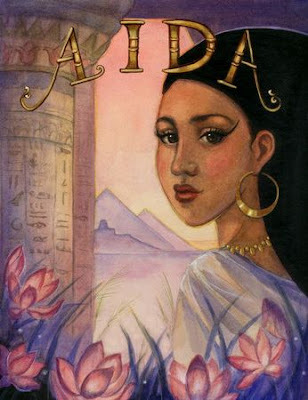 Aida is an Ethiopian princess who is captured by the Egyptians and made to serve Queen Amneris. She falls in love with a young general who the queen is also in love with. When their secret romance is found out they are both condemned to death by the jealous queen. From the Chronicles of Narnia series, The Lion the Witch and the Wardrobe, one of my favorite books as a kid (and even now!). 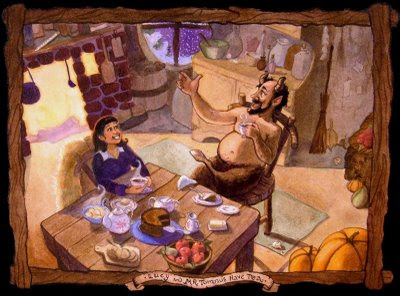 Lucy meets Mr Tumnus the faun and is invited in for tea. 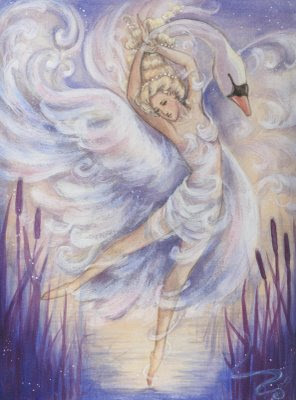 This illustration comes from the ballet story of Swan Lake. 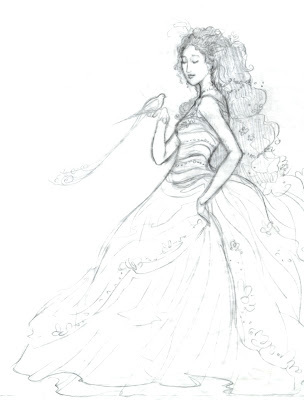 In the story the beautiful maiden Odette is trapped in a swan form during the day and transforms into a human at dusk. 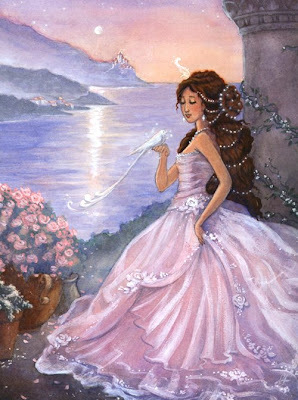 She falls in love with the prince but must transform back to a swan at dawn every day, unless the spell can be broken and she can be freed. My sister Angela is a ballerina and I used pictures of her dancing for my sketches. I love how ballet can tell a story through movement, drama and music.